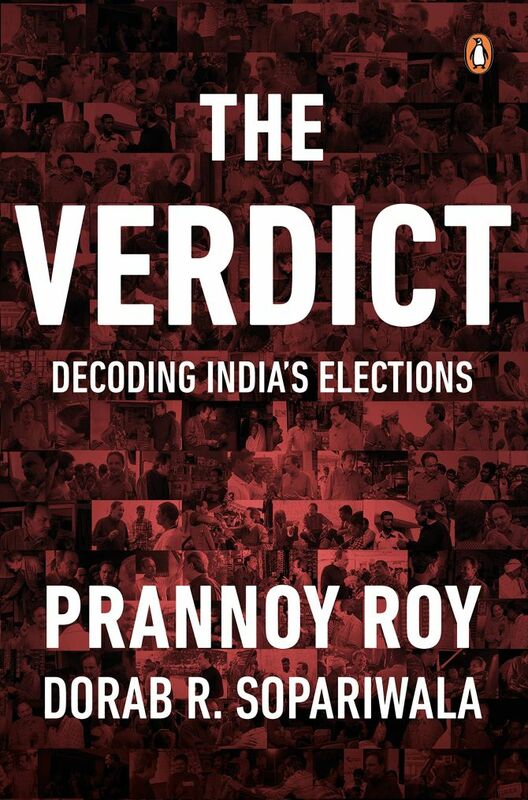 In The Verdict -- Decoding India's Elections, Dr Prannoy Roy and Dorab R Sopariwala, pioneers and arguably the best names in psephology in India, analyse databases of elections past and point out trends that will impact the 2019 Lok Sabha elections. 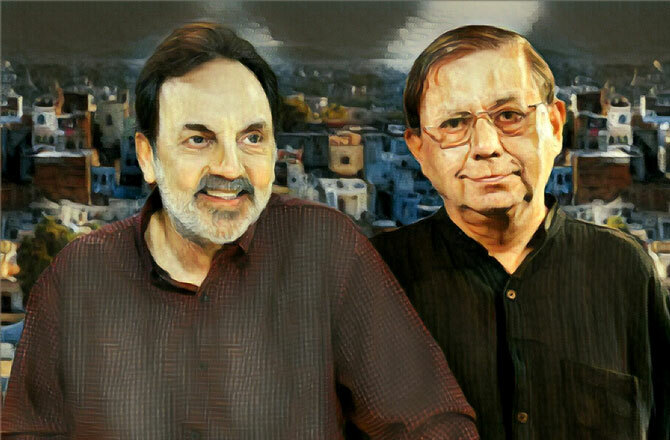 Roy, as co-founder of the NDTV group and Sopariwala, its editorial advisor and a market research veteran, have spent close to 40 years studying Indian elections and the electorate. Published by Penguin Random House India, The Verdict is the go-to book for the largest exercise in democracy in the world. "We are no longer in the anti-incumbency era. That era finished in 2002. We are in a 50:50 era, we are in a perform or perish era. If you perform you will be voted back; if you don't, you are out," says Dr Roy. Dr Roy and Sopariwala spoke to Rediff.com's Swarupa Dutt. The concluding segment of a telephone interview. You say that the key to winning an election is to win the rural votes. How much will farm/agrarian distress affect results. Will it also affect turnout? Prannoy Roy: From our field trips so far, right across Uttar Pradesh and a few other states, we have found that agrarian distress is a very, very important issue. Farmers are really suffering, they are really worried about their future. But for an important issue to become an election issue, it has to fulfil two conditions -- one, the issue has to be important to me as a voter -- and second, one party must be seen to be better than the other parties at solving the problem which is why sometimes issues like corruption don't become an election issue because all parties are believed to be equally corrupt. So today even with all their distress, farmers have to still decide if one party is better than the other at solving their distress -- only then will it become an election issue. So will the turnout in rural, agrarian, India be larger than the earlier Lok Sabha election? Prannoy: There's been a rising trend anyway (rural turnout being higher than urban). Dorab R Sopariwala: Voter registrations are going up, so turnout in absolute terms will go up too. The PM's minimum income guarantee for small farmers, Rahul's Rs 6,000 per month per family income guarantee, will they be game-changers? Prannoy: These kind of issues can only be assessed by large opinion polls. How much each policy has an impact on voting patterns and the percentage of vote -- we will be doing using polls to answer these questions. The story of elections is what we as journalists ought to do. It's important for journalists and reporters to understand it's not our profession to forecast. Our profession is to tell the story of elections, the issues of elections, what matters to people. But forecasting is better done by pollsters. Perform or perish/the anti-incumbency trend that you have written about, how true is it for 2019. Dorab: The voter has to believe that you've done something for him. Not necessarily for the country as a whole, but for her or him, for her family, her children's education. Do welfare schemes reach her? The voter weighs the pros and the cons. The minimum food support price benefits, do they reach her family? Is Pulwama going to make a difference? This is for polls to find out and journalists to report. This is not a one issue election, it's a multi-issue election. Prannoy: But we are no longer in the anti-incumbency era. That era finished in 2002. We are in a 50:50 era, we are in a perform or perish era. If you perform you will be voted back; if you don't, you are out. In the anti-incumbency era (1977 to 2002) even if you performed you were thrown out, the voters were so angry. We are no longer in the angry voter, anti-incumbency era. We are in the 50:50 era of the wiser and more discerning voter. The 'play safe' factor in forecasting -- what kind of percentile difference does it actually translate to? And is the play safe factor particularly pronounced among minority community voters? Prannoy: There are two things -- there's play-safe among voters and play-safe among pollsters. In the case of play-safe among pollsters, most samples have an error of +- 3 per cent. In India, with the complexity of converting votes into seats, a 3 per cent swing in votes, causes a 100 seats to change hands. Since a swing in seats is very sensitive to a swing in votes, pollsters say, 'OK it's so sensitive and it makes such a difference, I better be cautious, I'll take one standard deviation down and say this is the minimum that the party is going to get'. On the other hand, voters who play safe, well, first they have to know that you are not from a political party and that you are just doing a poll and then they trust you they do open up and tell the truth. So, more often than not, voters are telling you the truth. Prannoy: Oh yes, overwhelmingly so. Dorab: 90 per cent of exit polls have been right over the years because most of the time the voters are telling the truth. Like political parties, do voters too believe that EVMs are not secure? Or is this simply the refrain of parties that lose? Prannoy: India is a country of conspiracy theories. And for losers it's a really good excuse to blame the EVMs. What we've said is - based on the evidence so far and despite all efforts to try and discredit EVMs, there is no evidence to suggest that EVMs can be tampered with. So it's just a very good excuse for losers. And by and large we have found that voters do believe that EVMs cannot be tampered with. Dorab: Every single political party in the country has complained that EVMs can be tampered with only when they lose. You don't have to be a great mathematician to put two and two together. If you lose, EVMs aren't working, if you win, they are fine. In fact, if people could only be bothered to go to the EC Web site where there is an incredibly detailed explanation of how an EVM lands up at a particular constituency. Apart from the fact that there is no Wi-Fi, (Internet and Bluetooth connectivity) and so much care is taken (by the Election Commission to prevent hacking and tampering). Really, there is no reason to believe that EVMs can be tampered with. So, should one expect a good turnout in the polls? Prannoy: Yes, we expect a record turnout in this election. There is a rising trend of higher and higher voter participation with each election. Conventional wisdom says a good turnout doesn't favour the incumbent regime. Prannoy: You're right it is only conventional wisdom -- there is no data-based evidence of that either way, actually. So far it has not been clear whether and who benefits from higher or lower turnout ... a lot of people have tried to work on it, but have not discovered any firm relationship. We've done some work on this relationship between turnout and which party gains or loses and we arrive at some conclusions that low turnout benefits the BJP (Bharatiya Janata Party). However more research is needed. Dorab: Low turnout helps cadre based parties, high turnout helps non-cadre based parties. But much more work needs to be done on this. The Mahagathbandhan is an army without a general, or more generals than foot soldiers. 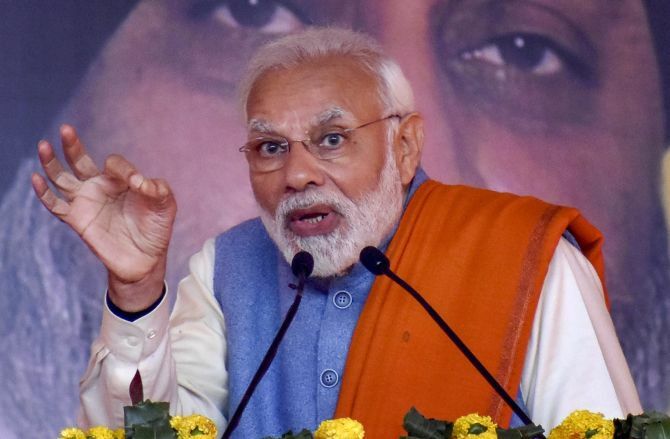 Will the lack of a prime ministerial face and the constant infighting between the Congress and Janata Dal-Secular sound a warning to voters and therefore affect the MGB's chances of a win? And there's Mayawati's statement on Congress's minimum income programme for instance and Rahul's statement against the TMC. Look, we're just starting on our field trips and we are going to every state and we will be doing exit polls and talking to people. Elections are not won by flamboyance, oratory works as long as it is combined with development, you say in your book. Is this in effect your verdict for the 2019 polls -- that the PM, who even his worst detractors will admit, is a good orator, will lose in the face of lacklustre development? Prannoy: (Laughs) That's trying to put words in our mouth. Actually, the voter will decide whether this government has delivered on the ground or not and that will be the deciding factor in this election. Dorab: Oratory does work, but even what work (development) has been done is as much a functional reality as what the perception is. So if they perceive that the government has done work and the prime minister reinforces that perception, then obviously they will vote for him. But what about the voter in the middle, the swing vote? Each party or each group has a certain number of committed voters. It is the uncommitted voter which will swing one way or the other. Don't forget the BJP in the last election almost doubled its vote. Even if they were not traditional BJP supporters, they were convinced about Mr Modi. The government runs on its record, the Opposition runs on its promises. If the voter perceives that Mr Modi has performed well and he reinforces it, they will vote for him. Otherwise, they won't. Also the (Congress promise of a minimum income guarantee of) Rs 72,000 per annum, have they got to know about it? Don't forget just because it's been announced it doesn't mean that all of the country gets to know about it. How did the BJP win in Uttar Pradesh in 2017 despite demonetisation and without a development plank? Prannoy: The main reason for the BJP winning in UP was a divided Opposition. One of the problems with the media is the way we look at whether there a wave or not -- is the BJP back to 2014 levels etc? However, elections in India are won and lost on the basis of Divide and Rule A divided vs united opposition is crucial. As important as the popular vote in an election is alliances. 2014 wasn't really a Modi wave, it was a divided Opposition that helped Modi win UP in both 2014 and 2017 -- if the Opposition had been united in those elections the BJP in UP would not have won half the seats. You have said that most opinion polls, 97 per cent, get it right. How did every opinion poll get the 2004 elections wrong? Prannoy: I don't think enough work has been done on it to find out why it happened. The idea behind is the book is to highlight certain trends from the data present then provoke further research. Dorab: Also you mustn't forget that the difference between the Congress and the BJP was just about 10 seats. So had there been a vote swing by 1 or 2 per cent in 2004, the BJP might have become the single largest party and we could then have said we got that point right too. I don't think there have been any elections that were as tight as the 2004 elections. Prannoy: And polls all over the world get it wrong from time to time. UK polls got Brexit wrong, US polls got Trump wrong. The BBC has got the exit polls wrong two or three times in the past. It's not an exact science. Dorab: And it's not a census. It's based on sample size. It was a very closely fought election. The India Shining (the Atal Behari Vajpayee-led 2004 campaign) was probably urban India. Rural India wasn't shining. People got taken in by the media in urban India. Obviously, the voter showed that rural India wasn't shining as much urban India was. It's in these instances that we realise that the rural voter decides what happens to the fate of this country, not the urban voter, not the urban media.